When tackling your spring cleaning, it's important to keep the environment top of mind. 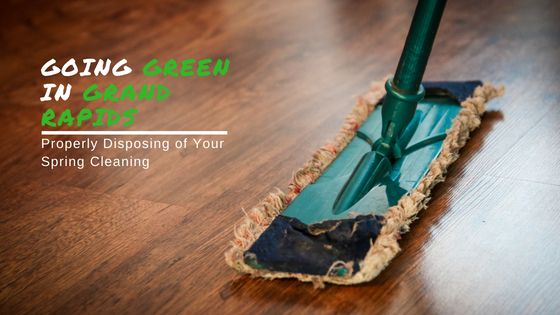 Learn how to keep Grand Rapids clean when tackling your projects this spring. Out with the cold, in with the warm! After a month of record low temperatures and a few blankets of snow, it’s finally starting to warm up here in Grand Rapids! If you’ve procrastinated on breaking down and disposing some of those odious household items your roommates or spouse have politely (and repeatedly) asked you to dump, you’re not alone and it’s not too late to redeem yourself! Follow this guide so you can learn how to safely get rid of everything from old, outdated media units and toothbrushes to broken recliners and TVs. We’ll also discuss how your spring cleaning can be more environmentally and cost friendly so that your attempts to go green don’t leave you in the red. One of the hardest parts of spring cleaning is discarding large, worn-out pieces of furniture. Luckily, you’ve got a few options here: reusing, recycling, and disposal. Reusing could mean anything from breaking something down into its core components and making something new out of it or donating the item to a charity. Old toothbrushes can be repurposed into baseboard brushes and old towels can become mop heads. If you decide to donate, make sure your items are in good condition. Recycling is a growing industry and social trend, so it’s easier than ever to do. Unfortunately, a lot of people don’t know that textiles like shirts, curtains, comforters and sheets, even when they’re stained and ripped, can also be recycled. Electronics, including device cords, can also avoid the landfill through buy-back programs or local recycling centers like Advanced Technology Recycling. Some retailers also offer electronic recycling on a limited number of items, like cell phones, batteries and light bulbs. Car dealerships and junkyards are always willing to take in your spare auto parts, car batteries, used motor oil, filters, and used vehicles. In terms of level of environmental friendliness, disposing of items isn’t ideal, but it’s better than digging a hole in your background and letting dangerous toxins leak into the soil. Landfills are also becoming more environmentally friendly as technology improves and new solutions become put into common use. If you’d rather a service do all of the reusing, recycling, and donating for you. You can hire a local waste removal service like 1-800-GOT-JUNK? Grand Rapids. Where all you have to do is point at the items that you’d like to get rid of and they’ll handle the rest. Finished with the heavy-lifting portion of your spring cleaning, but still in need of some spring cleaning angels because you’re part of the 8 percent of Americans who don’t know the right cleaning products to use? Grand Rapids offers a number of home cleaning services, from Cascade Fresh Cleaning and Cleaning Authority to Clean Corners. If your office also needs some refreshing, many of these services are qualified to manage offices as well. If you feel like you’re up for the job yourself (or just want to save money), make sure you’re purchasing eco-friendly cleaning supplies with natural ingredients, instead of toxin-heavy cleaners that can be harmful to the environment if they leach into the soil. Make your own storage boxes: Ever go into IKEA and want to buy every storage box you see? Well don’t. There are plenty of old household items lying around your house which can be creatively recrafted to store items, as well as DIY sites to help you out. Switch to nontoxic, biodegradable cleaning products: While the plastic bottles themselves may be recyclable, the chemicals within them aren’t, and they can leach into the soil if improperly disposed of. Medications also pose harm to the environment and general public if improperly disposed. With the increased awareness of the national drug addiction epidemic and the abuse of medications, it’s important that you lock medications in your cabinet and dispose of them properly when they expire. Ask your local pharmacy or health clinic how best you can dispose of medications, and look out for the next National Prescription Drug Take Back Day collection so you can make sure they don’t end up in a landfill or in the hands of the wrong person. These recommendations also apply to needles, syringes, and lancets, none of which should be recycled. Invest in a couple reusable shopping bags and use those instead of plastic bags when going grocery or clothes shopping. Not only will you be able to carry more items in your reusable bags, but you’ll also be able to reduce the number of plastic bags you inevitably hoard in a kitchen cabinet. Everything from the smallest steps, like converting your toothbrush and recycling a shirt, to big moves, like calling a disposal service to take your old refrigerator to a landfill instead of asking your sketchy cousin Saul to do it, matter. In a city like Grand Rapids, it’s easy to forget how important your own environmental impact can be, but taking these measures to keep Grand Rapids clean saves both you and the city hundreds of dollars every year. Which add up and multiple over each citizen that does their part. At the end of the day, spring marks a great time for us to freshen up our lives, households, and community. By taking the steps outlined above, we’ll be able to help keep Grand Rapids a clean, vibrant community.